Portions of this website are reprinted under the Fair Use Doctrine of International Copyright Law as shared material without benefit of financial gain. This Web site may contain copyrighted material whose use has not been authorized by the copyright owners. We believe that this not-for-profit, shared use on the Web constitutes a “fair use” of such copyrighted material should it be used (as provided for in section 107 of the US Copyright Law.) If you wish to use this copyrighted material for purposes that go beyond fair use, please be advised it is your responsibility to first obtain permission from the appropriate copyright owner. 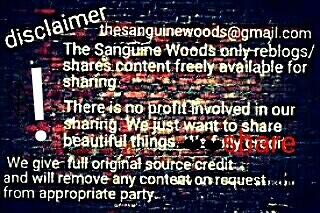 All content, written or visual, posted at The Sanguine Woods (TSW)—or at any of its affiliate blogs (See the About the Blogger page), which was not written or created by TSW is attributed to the original owner/creator, accordingly, as such knowledge is available to the TSW. The opinions and viewpoints expressed herein are not necessarily those of the blog/its administrator(s)/owner(s). Most visual elements posted at The Sanguine Woods are derived from digital captures (photo/scan) of the original image (e.g., the book cover). The creator of this digital version is irrelevant as the copyright in all equivalent images is still held by the same party. Copyright held by the publisher or the artist. Claimed as fair use regardless. Portion used is in most cases only a small portion of the commercial product, e.g., the book cover. The images used serve as the primary means of visual identification of the subject (e.g., the book). It also illustrates educational articles about the book from which the cover illustration was taken. There is no free equivalent of this book cover, so the image cannot be replaced by a free image. The use of the image will not affect the value of the original work or limit the copyright holder’s rights or ability to distribute the original. In particular, copies could not be used to make illegal copies of the original item.